The question basically expects us to discuss the rights and protection accorded to MEI and the debate surrounding the status of MEI like Jamia Millia and AMU. Examine – When you are asked to examine, you have to probe deeper into the topic, get into details, and find out the causes or implications if any . Examine the debate over the status of AMU and why in that case the constitutional protections accorded to MEI is not sufficient. Conclusion – Mention that the question needs quick resolution to ensure that the confusion over who MEI is gets resolved sooner rather than later. Out of the many provided fundamental rights under Part III of the Constitution, it also specifically provides for the educational rights of the minorities to establish and administer the educational institutions of their choice under Article 30. Article 30(1) recognizes linguistic and religious minorities but not those based on race, ethnicity. It recognizes the right of religious and linguistic minorities to establish and administer educational institutions, in effect recognizing the role educational institutions play in preserving distinct culture. A majority community can also establish and administer educational institution but they will not enjoy special rights under Article 30(1)(a). The right of any section of citizens, under Article 29(1) having distinct language, script or culture of their own to conserve the same entitles them to establish and maintain an educational institution for this purpose. Those who argue against the current government’s stand hold that there is a difference between incorporation and establishment. The statutes incorporate these institutions as universities but they are still established by minorities and hence are liable to enjoy the special rights accorded to MEI mentioned above. In certain cases, state governments have denied minority status to educational institutions on the ground that the aims and objectives of the societies/trusts setting them up did not clearly specify that they were meant to serve the interests of the minority community. A number of minority institutions similarly face enormous problems in getting approval from the Income Tax department under section 80(g) which provides for exemption of donations from payment of income tax. Many tax officers have ruled that religious minority institutions are not eligible for such exemption. The issue is that both JMI and AMU are run mostly through Government- Grant and they are given Central University status and a university cannot be at the same time both Central university and Minority institution. Centre also states that minority status to AMU and Jamia Millia Islamia universities is “unconstitutional” and “illegal” since these two government-run institutions were discriminating against Scheduled Castes, Scheduled Tribes and Other Backward Classes by using the minority tag. The other step to reduce regulation is the government’s intention to select 10 public and 10 private universities and make them autonomous. 20 universities have been invited to decide their own fate, without the interference of the government. The government has chosen to cancel the minority status of these AMU and Jamia milia Islamia universities, even though these are not the only ones that have minority status. The government’s stance on Jamia and AMU, instead of underscoring ideology, should have opened up the debate on the larger regulatory mess in higher education. The constitution explicitly recognizes the right of minorities to establish and administer MEI. It is the duty of the government to ensure that the rights guaranteed to minorities are not turned into a teasing illusion and promise of unreality. These guarantees are essential in a democratic and pluralistic country like India. The fundamental right of minorities to set up their own educational institutions benefits Indians of all religions depending on which state they happen to live in. Topic:Issues relating to development and management of Social Sector/Services relating to Health, Education, Human Resources. The question wants us to write in detail about the country’s most successful DDT programme, and discuss the changes required in such programmes along with proper arguments justifying it. We also have to write in detail about the legal mechanism in place in India to regulate organ transplantation. Comment- we have to express our knowledge and understanding of the issue and form an opinion on whether some policy changes are required to be made by India in the context of the controversy arising out of the country’s most successful DDT program. Discuss- we have to write in detail about the legal mechanism in place in India to regulate organ transplantation. Introduction- mention that Tamil Nadu’s DDT program is one of the most successful DDT programs in the world. Also, briefly discuss the recent controversy arising out of the program. Discuss the issues arising from organ transplantation like Tamilnadu’s DDT program and discuss why India needs to bring in some policy changes to solve the problem. E.g more subscription of wealthy, foreign donors; commercial transplantation scandals, high costs of transplantation, high demand for organs but limited capacity to pay etc. Then highlight the required policy changes. e.g building the capacity of public hospitals, subsidising transplantation, enabling affirmative action in the allocation process in favour of public hospitals etc. Mention that health is a state subject then many states have ratified the Transplantation of Human Organs Act, 1994 and the Transplantation of Human Organs Rules – 1995. Also, discuss the salient provisions of this legal mechanism. Conclusion– draw a fair, balanced and concise conclusion on the given issue. Tamil Nadu’s deceased donor programme is one of the best in the country and that public credibility is key to its continuing success. Recently in a leaked message the head of the National Organ and Tissue Transplant Organisation (NOTTO) claimed that foreign patients who are waiting for a donor heart transplant are being prioritised over Indian patients by private hospitals in Chennai. Organ transplantation in India (this includes Tamil Nadu) largely became a private sector activity. Hence while the act of donation is a public act and the organs a public good, from that point onwards whatever happens is largely under the private sector. The rules of market medicine thus dictate who the organs go to. Unlike the liver and kidneys, a heart transplant cannot be performed with a living donor. Incidentally, around 20% of living donor liver transplants performed in some of the large centres in India are also on foreigners. So patients with advanced heart failure from certain countries which do not have a deceased donor programme have no option but to try their luck in India. As these are largely performed in corporate hospitals, the costs in India are well beyond a large majority of the local population. Even with the current practice of allocating an organ to a foreigner when there is no suitable Indian patient, one-third of all hearts and lungs are still not being used due to “lack of a suitable recipient”. An additional issue with heart and lung transplantation is the strict criteria for size and quality and the very tight timeframes within which these organs should be transplanted. Shortage of organs, lack of transplant facilities and high cost of transplant in private facilities are major barriers for renal transplantation in India. The DDT rate in India is now 0.34 per million population, among the lowest in the world. Post-transplant immunological and pathological surveillance of recipients remains a challenge due to the scarcity of infrastructure and other facilities. Advanced immunological facilities for screening and matching are available only in the private sector and those available in a few flagship government hospitals charge a fee for the tests. Develop a system of zonalisation across the country so that more efficient sharing of organs across States is feasible, possibly with the development of a publicly-funded air ambulance service. This will significantly benefit transplant programmes in government hospitals. The process should be made more transparent and accessible to the public. If donation and the allocation of each organ can be tracked, that will be a strong deterrent to mischief. Most importantly, the outcome of every transplant should be monitored. Strengthening the capacity of the public sector, subsidising transplantation and perhaps enabling affirmative action in the allocation process in favour of public hospitals. One of the secrets behind Europe’s high donation rates is public trust in their respective nationalised health schemes. India needs to ensure that. The primary legislation related to organ donation and transplantation in India, Transplantation of Human Organs Act, was passed in 1994 and is aimed at regulation of removal, storage and transplantation of human organs for therapeutic purposes and for prevention of commercial dealings in human organs. After this deal, the concept of brain death was legalized for the first time in India. According to Organ Transplant Laws, no money exchange between the donor and the recipient was allowed. According to the 1994 Act, the unrelated donor had to file an affidavit in the court of a magistrate stating that the organ is being donated out of affection. Later, the donor had to undergo a few tests before the transplant. The Authorization Committee checked all the supplied documents. An amendment to the act was proposed by the states of Goa, Himachal Pradesh and West Bengal in 2009 to address inadequacies in the efficacy, relevance and impact of the Act. The bill made amendments in the Transplantation of Human Organs Act, 1994. Along with human organs, the Bill also regularized the transplantation of tissues of the human body. The act permitted donations from living persons who are near relatives. This act also added grandparents and grandchildren to the list of near relative. The doctor had to inform the patient or his relatives about the possibility of organ donation and made sure that they given their consent to it. If the organ of the donor and the recipient does not match medically, the bill gave a permission to swap organs with another pair of such a person. The bill made an increase in the penalty for illegal removal of human organs and for receiving or making payment for a human organ. The amendment to the Act was passed by the parliament in 2011, and the rules were notified in 2014. The same is adopted by the proposing states and union territories by default and may be adopted by other states by passing a resolution. C. Regulatory and advisory bodies for monitoring transplantation activity and their constitution defined. E. Swap Transplantation: When a near relative living donor is medically incompatible with the recipient, the pair is permitted to do a swap transplant with another related unmatched donor/recipient pair. F. Authorization for organ donation after brain death. If the state governments implement comprehensive strategies to increase donation through a proactive approach, together with the help of transplant teams, donation coordinators, and intensivists, in the coming decade, the organ donation rate can parallel the organ demand facing the country. Topic –Science and Technology- developments and their applications and effects in everyday life. Conservation, environmental pollution and degradation, environmental impact assessment. Science and Technology- developments and their applications and effects in everyday life. The question wants us to look deeply into the issue of the goals and plans to increase electrical mobility in India. We have to look into all the aspects of the issue and discuss what precautions should be taken before moving forward. Critically analyse- we have to dig deep into the issue and identify, briefly discuss the key aspects of the question. We have to bring out the need to take certain precautions before deciding and pursuing our goals in relation to increase electrical mobility in India. Introduction– mention the recent targets as indicated by NITI Aayog i.e 40% of personal vehicles and public transportation in the country should go completely electric by 2030. Discuss why precautions need to be taken before pursuing such a target.E.g lack of infrastructure, the dominance of public transport as a source of air pollution, a high number of two-wheelers in the country, high cost of EVs etc. Discuss in points what precautions should be taken. e.g prioritize public transport and two-wheelers, need to provide some subsidy, adopting swap battery model instead of charging model which is more suited to Indian conditions, demonstrate and learn from the experience in selected smart cities and then increase the ambit of the programme etc. Conclusion– mention that a step-by-step approach is required as the ecosystem for electric vehicles develops gradually, alternative models are pursued, and learnings from experience accrue. You can also better make your own conclusion based on your discussion and arguments. Electric vehicles (EVs) are growing in popularity and certainly in mind space. They are cleaner and more efficient, easy to maintain and there is an advantage of regenerative braking. On the whole it is a package to fight against climate change and global warming as green house gas emissions are reduced. Recent targets by NITI Aayog indicate 40% of personal vehicles and public transportation in the country should go completely electric by 2030. The government has asked auto companies to start manufacturing electric vehicles in India, and is also studying global markets to come up with a policy surrounding electric mobility and storage. The Government started Faster Adoption and Manufacturing of Hybrid and Electric vehicles (FAME)scheme which provides incentives for purchasing electric vehicle. Government is releasing tenders to increase charging infrastructure in the country. India will get its very first electric vehicle charging station in Nagpur. Karnataka state approved Electric Vehicle and Energy Storage Policy 2017. BS (Bharat Stage) protocol for Charging was formed to build the framework for future charging stations. India proposed to liberalize the permit system for electric vehicles to promote alternative fuels. It suggested raising the tax on diesel vehicles by 2% while lowering the tax on electric vehicles. Most worries hinge on battery costs and manufacturer readiness. Also at current the electric vehicles take longer time to charge than conventional vehicles. India does not produce lithium-ion (Li-ion) batteries currently, and companies making battery packs are dependent exclusively on imports from China. This is a cost-saving strategy as setting up a cell manufacturing unit in India would be expensive. But, accelerating EV use in India should be linked to the “Make in India” goal and domestic battery production. A more India-specific concern will be that of the electricity gridas there are doubts when it can successfully handle the demand. Will use solar photovoltaics (PV) to charge EVs.This means that Renewable energy may at best contribute some fraction of energy at different times but with personal vehicles and public transport mostly charged at night solar energy advantage as an alternative is constrained. There have been some concerns about previous experiences in China and Israel. But these models were meant for personal cars andwere costly. Besides, lack of marketing, proper execution and mismanagement led to the failure of the promising EV start-up in Israel Better Place. The subsidy structure also became distorted, favouring large batteries. Policies have to be developed to facilitate the indigenization of battery assembly, and manufacture of EVs and their basic components. Currently, there are distortions with the goods and services tax (GST). The GST rate on batteries is 28%, while it is 12% for electric vehicles. Multiple ministries such as Road Transport and Highways, Housing and Urban Affairs, Heavy Industries, Power, New and Renewable Energy, External Affairs as well as national institutes such as NITI Aayog should work together. State and city-level players need to be involved so as to address several technical and infrastructural needs. Charging infrastructure for electric vehicles in India has not been fully developed yet. EV charging is more than just using electricity. It involves exchange of informationrequiring a communication protocol. The absence of a standard global infrastructure is a major deterrent for EV penetration in India, as creating infrastructure can be cost-intensive. The government needs to select or develop appropriate and safe charging technology that avoids multiplicity and reduces the cost of infrastructure. EVs and the grid can have enormous synergy. Not only can EVs charge whenever there is “surplus” power, they have a battery useful for absorbing variable renewable energy. They can even offer backup power for the grid. EVs can and should use Renewable energy as much as possible as it helps in cleaning the environment. India could compensate cleaner vehicles through reduced registration charges, or even aim for mandating EVs for taxis and selected (urban) public transport vehicles. There are other ways to spur EVs, including dedicated charging spots, and discounted or free parking. The government mainly needs to create the right frameworks and help overcome “network effect” problems, covering both the grid and charging infrastructure. In order to avoid a scenario like the one that played during the oil crises of the 1970s it is imperative that India secure mineral supplies for its domestic industry by acquisition of overseas assets such as mineral reserves and the associated production. India has long-term trade relations with lithium-producing countries in Latin America through preferential trade agreements (PTAs). India needs to formulate policies incentivising domestic public and private mining companies to invest in overseas lithium mining assets. India does need to have a low-emission vehicle policy, one that surrounds alternative energy sources such as bio-gas and bio-diesel. Because hybrids are a mesh of existing and future technologiesand do not require the establishment of charging infrastructure, although popularising plug-in hybrids that can be charged both from their own engines and the grid, will actually help in the gradual seeding of such infrastructure before a shift to electric vehicles. Focus on wireless rangingas it allows for significantly smaller batteries or the ability to travel longer distances with a larger battery. Ideally, the best course would be to select five smart cities with the objective of fully electrifying their public transportation as well as 50% of their two-wheelers by 2025. Different countries have different approaches to increase the EV penetration. For example China has focussed on Electric busesas catalyst for EV penetration. On the other hand, Netherlands has captured the EV market using a simple yet well-crafted strategy of creating charging infrastructureand encouraging investment in charging technology. It’s a major exporter of this technology too. Hence, the impact on employment in the wake of shift to Electric vehicles needs to be thoroughly studied. Bold initiatives and robust investments in technological research are required to turn its EV dream into reality. When India is focusing on reaching the targets on the Paris agreement and striving for cleaner environment the focus on electrical vehicles is the right direction. The article explores two important threads of thought – the changed nature of environmental movements where urban citizens are taking the lead and the lax EIA norms for construction activities. Since EIA is a topic in GS3, this question becomes important. The question first asks us to mention the EIA guidelines, particularly the lacunae in them. Examine whether the kind of changes being proposed would aggravate or address the problem. Discuss the need of a paradigm shift to take environmental concerns seriously by strengthening eia procedure. Introduction – Highlight the protests in Delhi and the questions that it raises. Examine whether the changes under consideration would aggravate or address the issue. Bring out the perspective of need of construction for building low cost houses etc and the impact it has on environment. Discuss how can the norms be strengthened to reconcile both objectives. Conclusion – Conclude your answer by emphasizing on the importance of tackling this in light of the heightened citizen awareness regarding environmental concerns. Recently the government proposed to ease the environment rules for the building and construction sector, stipulating that projects of less than 50,000 square metres size would not require environment clearance (EC). There have been protests in Delhi recently over cutting of trees to redevelop residential colonies. The building and construction sector is governed under the Environmental Impact Assessment (EIA) notification 2006 under which any project of more than 20,000 square metres requires EC. But in December 2016, the Union environment ministry introduced a new system wherein projects up to 300,000 square metres would not need the mandatory EC once state authorities had integrated environmental conditions with their building bye-laws. Building and construction sector is governed under the Environmental Impact Assessment (EIA) notification 2006 under which any project of more than 20,000 square metres requires EC. EIA is a procedure used to examine the environmental consequences or impacts, both beneficial and adverse of a proposed development project and to ensure that these effects are taken into account in project design. The housing projects fall under category – 8 (a) of EIA Notification, 2006 (as amended). The built up area for the purpose of this Notification is defined as “the built up or covered area on all the floors put together including basement(s) and other service 8(b) of EIA notification deals with townships and area development projects. The environment impact assessment entails eight steps wherein each step is equally significant in influencing the overall performance of the project. Characteristically, the EIA progression commences with screening to certify that the time and reserves are concentrated at the proposals which matter environmentally and concludes with some kind of follow up on the execution of the verdicts and actions taken as an outcome of an EIA report. (a) Screening: This first stage of EIA establishes whether the anticipated project, necessitates an EIA and if it does, then the intensity of assessment required. (b)Scoping: This step recognizes the key issues and impacts which further needs to be investigated and also delineates the periphery and time limit of the study. (c) Impact Analysis: The third stage of EIA identifies and envisages the likely ecological and social impact of the anticipated project and weighs upon the implication. (d) Mitigation: Mitigation advocates the actions to lessen and steer clear of the possible adverse environmental upshots of development activities. (e) Reporting: The end result of EIA is accounted in a form of a report to the decision making body and other concerned parties. (f) Review of EIA: It reviews the sufficiency and efficacy of the EIA report and makes available the information essential for decision-making. (g) Decision-Making: It decides whether the project is cast off, accepted or needs additional alterations. (h) Post Monitoring: This final step of EIA comes into play once the project is bespoke. It tries to make certain that the impacts of the project does not go beyond the officially permitted standards and execution of the mitigation measures are done in the manner as stated in the EIA report. Large constructions have been difficult to manage in India. The sector has systematically lobbied to be excluded from the environmental norms of the country and has been successful in carving out special privileges for itself in the environment clearance process. From 2006, most construction projects have been approved based on an application form instead of detailed assessment reports. 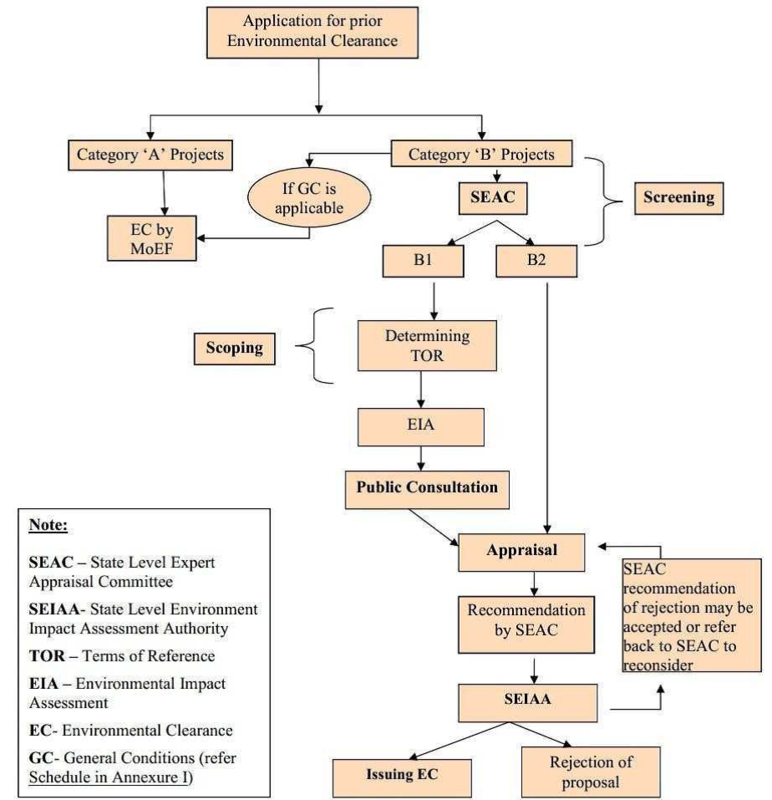 In 2014, schools, colleges and hostels for educational institutions were exempted from taking environment clearances as long as they followed specific sustainability parameters. In 2016, projects with areas of less than 20,000 sq m were permitted to proceed as long as they submitted a self-declaration ensuring adherence to environmental norms. As a result of these privileges, construction projects contribute significantly to urban air and noise pollution and high water consumption in cities. Compensatory afforestation taken up in lieu of trees felled by projects is a failure due to poor survival rates of saplings and no monitoring. In a literate, urban society that has high access to the Internet, the lack of official information on urban development and its impacts can only be understood as an indirect form of public silencing. There are no public hearings held for urban construction projects, and governments assume that citizens have nothing to say about them. The notification of government was challenged in the NGT, which in its 2018 judgment, called the December 2016 notification of MoEFCC a ploy to circumvent the provisions of environmental assessment. The tribunal had said that it would considerably dilute the environmental safeguards provided under the country’s environmental laws and asked the environment ministry to re-examine the notification. The burden of resource use in upcoming buildings or urban housing projects can be minimized in many ways. Properly designed housing projects can provide numerous services such as purification of air and water, pollution control, mitigation of floods and droughts, re-generation of soil fertility, moderation of temperature extremes, climate change mitigation and enhancing the landscape quality. The NCEPC, revived in a form reflecting the times, could be the body entrusted with the preparation of a workable policy document on “Environment and Development”. It could be fashioned on the model of the White House Council on Environmental Quality functioning in the US directly under the President. The Indian version could be under the Prime Minister advising him on matters referred to it by him or taken up by it suo moto for enquiry. The reason for locating the Committee directly under the Prime Minister is that environment being an all-embracing term, the issues it would deal with would often be the concern of more than one ministry and their examination has necessarily to be undertaken with a perspective larger than what any individual department or ministry may have. The article highlights this new issue in groundwater which has serious implications. Niti Aayog’s recent report on the situation of groundwater has already painted a bleak picture and uranium poisoning is the concern. The question is fairly straightforward in its demand. It expects us to discuss what the issue is about, examine the causes behind uranium contamination of groundwater, the impact in health etc and the ways in which this problem can be nipped in its bud. Discuss – Here one has to mention the specific details asked in the question in their discussion. Introduction – Discuss the findings of the report in Environmental Science and Technology Letters. Explain the problem – safe limit for uranium, how this increases the severity of groundwater crisis, in the past arsenic crisis was also a huge issue. Conclusion – Emphasize on the seriousness of the issue and the need to take preemptive active before the problem gets out of hand. Evidence of uranium contamination has accumulated from across India over the last decade. Scientists have found widespread uranium contamination in groundwater from aquifers across 16 states in India, much above the WHO provisional standard for the country. Study, published in Environmental Science and Technology Letters , has found over 30 micrograms per litre (mcg/l) of the heavy metal in parts of northwestern, southern and southeastern India. Many of India’s aquifers are composed of clay, silt and gravel carried down from Himalayan weathering by streams or uranium-rich granitic rocks. When over-pumping of these aquifers groundwater occurs and their water levels decline, it induces oxidation conditions that, in turn, enhance uranium enrichment in the shallow groundwater that remains. Groundwater chemistry that promotes the formation of soluble uranyl carbonate complexes. Another critical area of research is the mechanism by which uranium enters groundwater. The Environmental Science paper identified two types of terrains with heavy contamination. In Rajasthan and other northwestern regions, uranium occurs mostly in alluvial aquifers while in southern regions such as Telangana, crystalline rocks such as granite seem to be the source. When groundwater is over-extracted from such soils, the researchers suggest, the uranium is exposed to air, triggering its release. Drinking such water can damage one’s kidneys, and the World Health Organization prescribes 30 mcg/l as an upper limit. India is already a water scarce country so this revelation will further add to the water woes suffered by India. India is the world’s largest user of groundwater, with World Bank reporting that more than 60 per cent of irrigated agriculture and 85 per cent of drinking water are dependent on the resource, which is pumped up through borewells. This leads to further complications. Uranium in drinking water raises concerns not because of radioactivity but mainly because of its chemical toxicity. Uranium may also accumulate in crops irrigated with uranium-containing water. There is a need for revision of the current water quality monitoring program in India, evaluation of human health risks in areas of high uranium prevalence, development of adequate remediation technologies, and, above all, implementation of preventive management practices to address this problem. Including a uranium standard in the Bureau of Indian Standards’ Drinking Water Specification based on uranium’s kidney-harming effects, establishing monitoring systems to identify at-risk areas, and exploring new ways to prevent or treat uranium contamination will help ensure access to safe drinking water for tens of millions in India. It is urgent to make testing for uranium a routine part of the groundwater quality monitoring programme. 6)Three teenagers and two adults are arrested on burglary and stolen goods charges. The goods: $23,000 in computer equipment. The victim: Their high school. Among the suspects are the son of your newspaper’s general manager, the son of an elementary school principal in the same district as the burglarized school and the son of a state government division manager. The question is a part of GS-4 syllabus ( Case Studies). The question wants us to bring out the issues arising out of including the name of the father in the news of his son being caught in a burglary incident. We have to present our opinion and write in support of the opinion. Discuss – This is an all-encompassing directive which mandates us to write in detail about the key demand of the question. Here we have to write about the ethical issues involved, what should be done and why so should be done. Take the help of the article attached to the question to frame your answer. The Ethical issues involved here. E.g Reputation of the father, close relation of the agents (father-son), son is adult etc. Mention your opinion on whether you would mention the name of your general manager in the related news. Support your opinion with proper justification. The stakeholders involved in this scenario are the three teenagers and their fathers, two adults, newspaper management etc. Father’s identity can be hidden:-There’s a misconception that juvenile names are strictly off-limits but there are valid reasons for not naming minors even if it’s legal. For example, many news organizations do not, as a rule, publish the names of young people accused of less serious crimes. For Children, the thinking goes, that they should not be stigmatized for the rest of their lives for an error in judgment they made while growing up. However teenagers need to undergo trial as per law and attain punishment as their activity has been for fun which highlights the lack of ethical values in them. As the enlisted scenario shows the lack of judgment of the teenagers they need to be reformed rather than be severely punished which can even make them serious offenders in future. Also the reputation of the newspaper will not be at stake as the case is still under investigation and the teenagers are not convicted yet.